Taking inspiration from the ‘battle tank’, TUV300 has been shaped in a rather boxy manner which may or may not go well with the customer, reason being that some may find it tough and rugged while others may think that it is too plain jane to stand competition like Hyundai Creta, Maruti S-Cross, Ford EcoSport and Renault Duster. Mahindra TUV300 pictures of the outside testify the company’s attempt to come up with a rugged vehicle, but what really works for the SUV is that despite its small size it manages to appeal customers and is not mistaken for an oversized hatchback. Despite its sub-four meter length, the SUV does not seem petite or compressed, probably because it is not feature clad on the outside, the unnecessary styling to make it look sporty has been skipped which works well for it. Open the door and you can’t help but appreciate the fact that this is the best Mahindra cabin, until now. The premium black and beige interiors with chrome finish and metal accents, classy hexagonal centre bezel (it looks a lot like the one in Maruti S-Cross), piano black centre fascia, sporty twin pod instrument cluster, 2-DIN infotainment system, and steering-mounted audio and phone controls enhance the comfort inside the cabin. There are a lot of usable cubbyholes, too. The plastic quality, however, is not quite as good as you find in Hyundai Creta. Space is a Mahindra forte, and the TUV300 is no different. There is ample headroom, legroom and shoulder-room in both rows. While the front seats are very supportive, the rear seat, we feel, could have had better thigh support. The boot space (384 litres) is decent, but Mahindra has fixed two jump seats in the boot area, which eat into space. Although these jump seats can be used in emergency conditions, we don’t recommend sitting on these. The reason being, there are no seat-beats. That bit apart, the cabin is a cosseting place to be in. The team at Mahindra has put serious efforts in the refinement department. The car is much quieter without any vibrations when we compared it to elder sibling Scorpio. The engine and gearbox department as a whole needed a through revision and Mahindra addressed these feedbacks by introducing a more powerful mHawk100 engine. For the power hungry folks, the 1.5L engine bulges out 17PS and 10Nm more than the previous version, totalling the power and torque to 105PS and 240Nm respectively.The improved performance is not apparent in the low end of the rev range, however, once the rev start jumping, you will realize its true pulling power. The performance gets further noticeable in the mid-range and top band of the rev as the engine feels faster in terms of gear acceleration, especially once you are near the 100kmph mark. The updated engine has also made the overtaking a much easy affair, especially when you are driving on highways where it is normal to cruise at 80kmph or higher speeds. The spread of torque is also brilliant as you get peak torque easily between 1500 rpm and 2800 rpm as against the lesser powered version. This should also put less strain while cruising on highways. The engine though is refined and smooth just as the earlier one, however, it tends to get a bit noisy at higher revs.Fuel economy on offer stands at 18.49 kms in a litre which is commendable for a SUV. Like other Mahindras, this one too comes with a micro hybrid technology which includes a start-stop function. This feature in turn aides towards enhanced fuel economy. Besides, there is an option for eco mode too, that again enables increased efficiency. Seems like Mahindra had worked really hard on this one, not that it performs brilliantly, but the SUV is certainly impressive. The 80 PS diesel engine is capable enough to give a good start to the vehicle. There is that initial grunt like other Mahindras, hence there is lack of refinement. In fact there is an insignificant turbo lag too, but it does not bother much. Steering wheel is heavy, but responsive at the same time. Overall, it is a well suited car for city driving as it enables easy manoeuvrability. 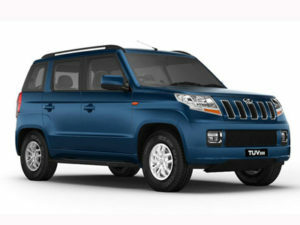 Depending on the variant you buy, you get features such as static-bending headlamps, Brake Energy Regeneration, Intellipark Reverse Assist, voice messaging system, follow-me home and lead-me-to-vehicle headlamps, and Mahindra’s Micro Hybrid technology and BlueSense mobile app.The TUV300 comes with a toughened, high-strength steel body shell, crumple zones, hydro-formed crush tips and side-intrusion beams for all-round impact protection. Again, depending on the variant, there are airbags, ABS with EBD, Corner Brake Control (CBC), etc. However, because it is a heavy vehicle (gross weight can go up to 2,200 kg), the front tends to dip when you brake hard.